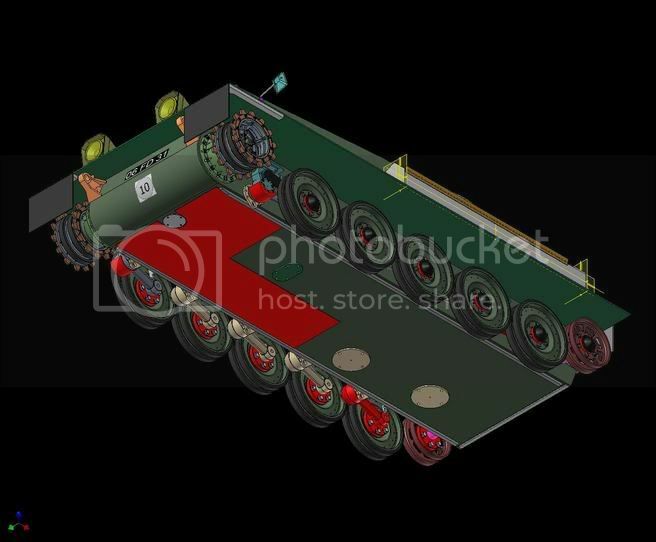 Thought I would post some pics of the CVR(T) I am working on. I plan (like the warrior that never got finished) to create a plans pack which will be available for download. Let me know what you guys think. 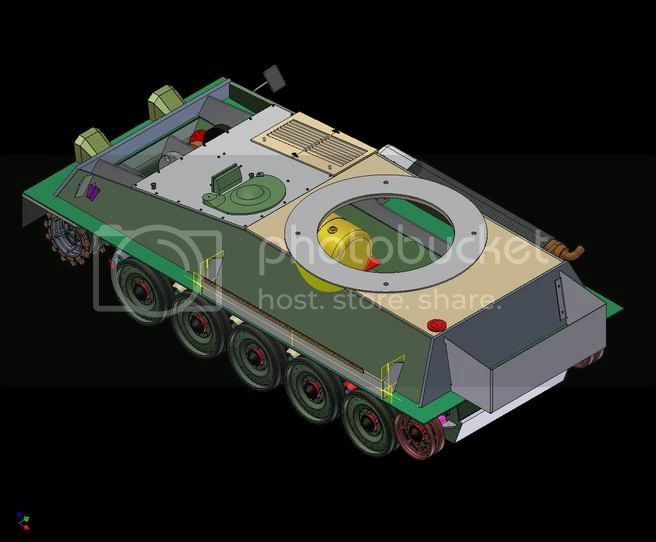 Incidentally I am having MAJOR problems trying to model the turret, so if anyone fancys sharing thier model making talents in building a true 1/6th scale Scimitar turret (which we could make resin copies) please let me know. The chassis is pretty much finished, the running gear will be completed within the next couple of weeks, work and family permitting! 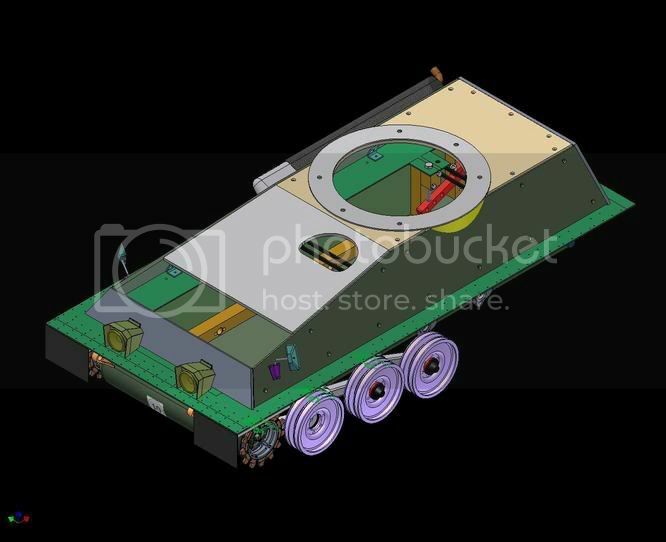 The chassis is designed to be welded up from laser cut profiled 2mm sheet steel, the top deck is going to be 5mm sheet perspex, laser cut (already sourced).The design is torsion bar suspension and is a hang-over from the warrio and also a prototypical design element. The current idler design is naff and incorrect, but it does show the general theme of how it will look. I was hoping to have almost every aspect of the running gear cast in alloy to minimise costs, as I plan (dream) of owning a Scimitar, Samson and Striker. Since they all share the main components it should be a doddle !!!cough!!! Last edited by AndyR on Mon Jul 11, 2011 12:03 am, edited 1 time in total. What happend to the Warrior project? Cant wait to see it in the flesh mate. Are you doing a plan pack for the warrior? The warrior is on HOLD at present until I can work out how to get the crane to work! I have staring at a 1/35th scale model of the warrior and associated 1:1 pictures of the beast for the last 2 years now. 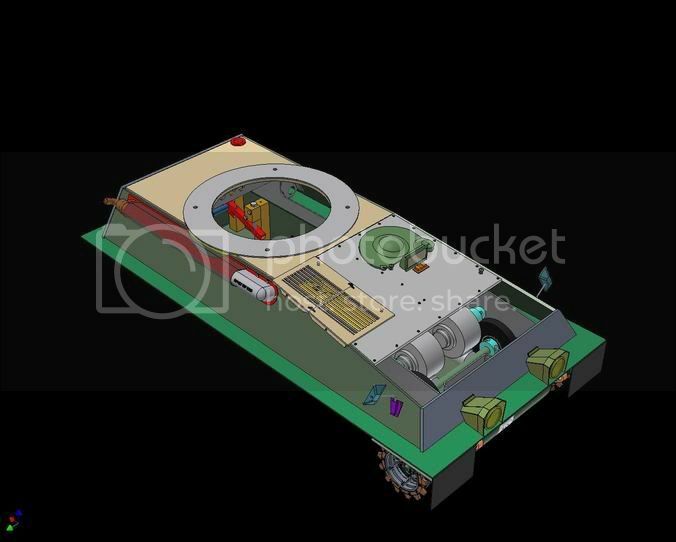 I have got some parts already made, such as all the running gear components, the basic main hull plates, the panniers and the sheet metal flooring. I am waiting to get back my track sprockets and the two main hull plates which need a bit of machining. The trouble is trying to imitate te Armortek route is very difficult (ie make it bolt together) and coupled with the fact I want to make an engineer varient just jacks up the complexity. I have got plans for around 50% of the warrior but until I sus out the various problems I have with the model and indeed until i recieve the outstanding machinied componennts I'm not going to take it any further - at present (plus I'm just plain bored of looking at it). The Scimitar is something I have been toying with since christmas and just recently acted upon it. I was intending to make the plans free to all who wants a copy to try and create a community project? It costs around 3K for a professionally made model from either Armortek, Mark-1 or Armorpax / Speahead. 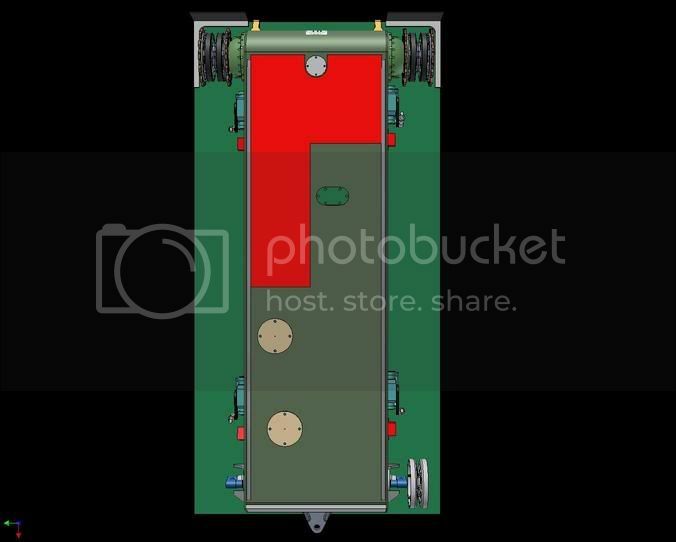 I was figuring if someone could produce some good plans, and if enough people were interested it could be used to provide a very cheap detailed model at a fraction of the costs. For example instead of paying Â£900 (600 for the zinc alloy moulds and about 1.50 for each link) for a mould and say 200 track links, you could dilute the costs over say three people (200 each for the moulds and 1.50 for each link). 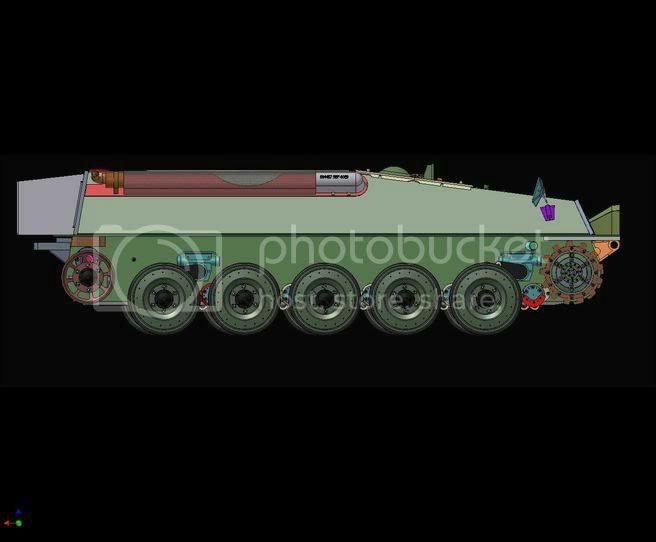 The community project idea will only go-ahead once i have completed all the drawing I can do (excluding the turret). 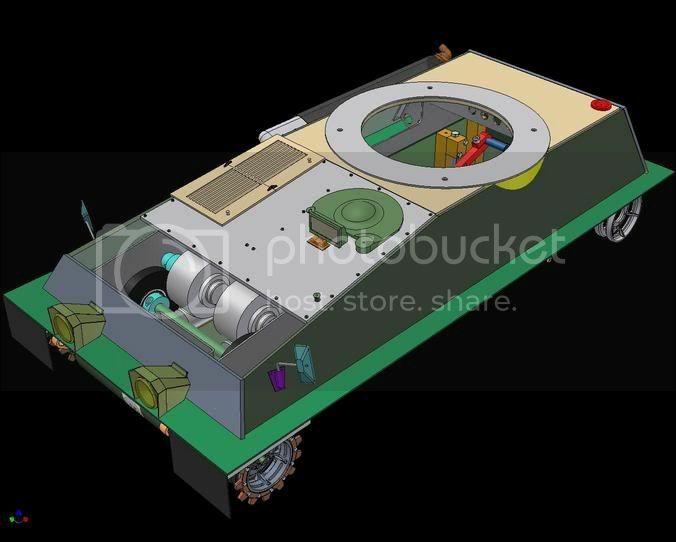 As I was saying earlier I am having so much bother trying to model the turret I was hoping / wondering is someone would like to help out and build a turret which could be cast in resin and made available to all who wanted a copy (Dave might it be worth your while?). At the end of the day I was just looking at trying to get the model built for as little as possible and if anyone is wanting to help out please let me know. Hopefully over the next few weeks (month or so) I should have the majority of the chassis and running gear complete. I could always have a crack at it, would be made from old washing up liquid bottles and yogurt pots though! 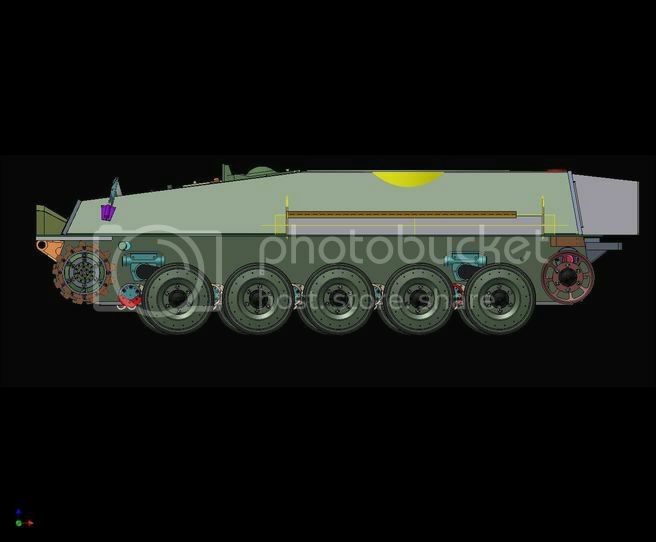 I woud be interestead in a Warrior, not a CVR(T). Its not that I wouldnt like one but I really like the look of the Warrior from the 1/35 kit, (I have made one but no longer have the distructions that came with it) in the desert trim, (May clash with the CR2 as that is green & black) I do like the look of Seans CR2 dessy though. Anyway mate if enough people get together on this one I may be able to chip in with it. Another possibility might be to â€œsectionâ€ a 3D model, print these out at the correct size on paper and use them as templates to cut balsawood sheet. Then glue them all together, sand, do any minor details, seal, lacquer and use to make your rubber model. This process is not something I have tried; just something I have thought of. 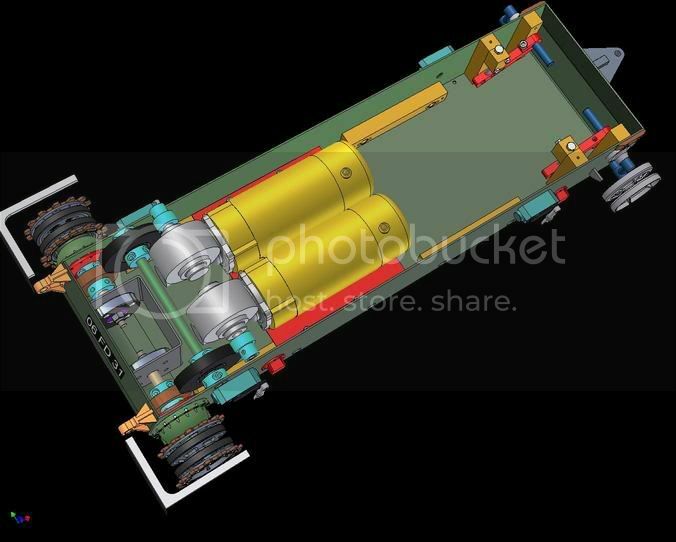 I am not even sure if you can section a 3D model in Inventor? It may be possible in modellers which use â€œConstructive Solid Geometryâ€, as might be used to generate scenes for Pov-RAY for example. Probably a lot of work to get setup (find out if it can be done and how)? Any help would be good. Best to wait until I have reached a stage where all the dwg are complete or almost complete. No point in me wasting your time in case it all falls through (eg Warrior). The warrior plans are not finished yet, and until I have a chance to solve some of the major problems (I need a eureka moment or two) the plans won't be finished. Plus I'm just plin bored staring at the same dwgs all the time (sure you understand). I need a fresh challenge to re-stoke my interest. 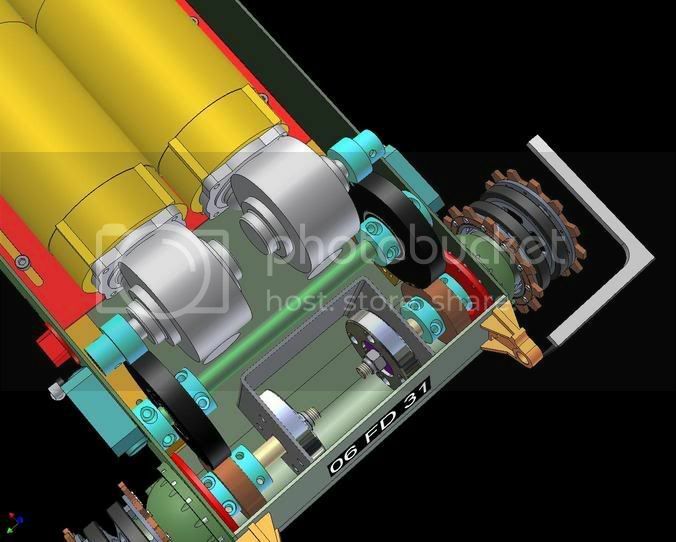 Your absolutly correct in sectioning a 3d dwg, I can at present do that in inventor no problem. my problem is I can't seem to breakdown the basic shape into simple enough components to allow it to be built up. I have already drafted up the Rarden, the smoke lauchers. 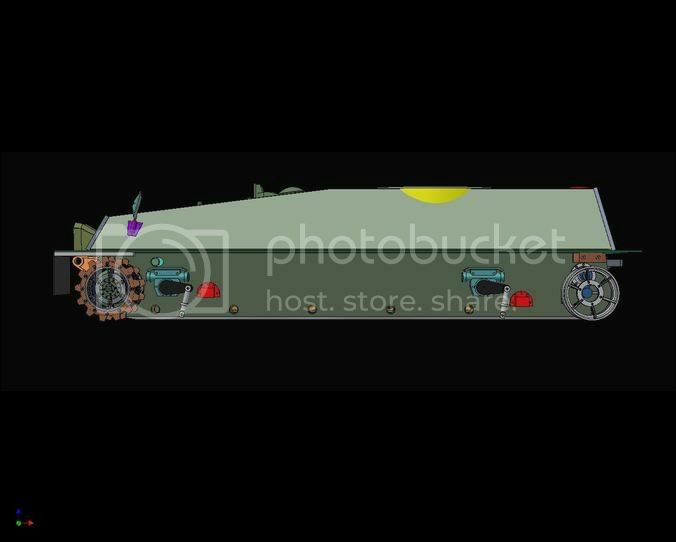 I just need some help to build the turret. 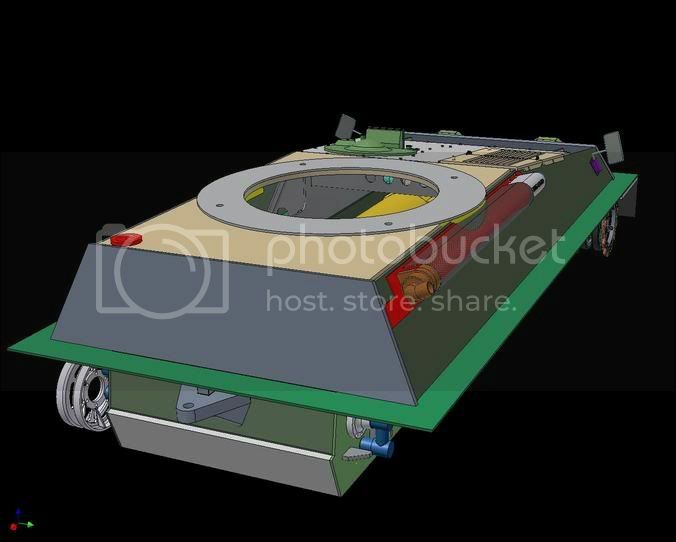 What I was going to do, is spec the turret requirements and design the base plate and lazy susan arrangement and hopefully someone would take up the challenge and build the turret which bolts onto teh interface plate (read turret bottom plate). 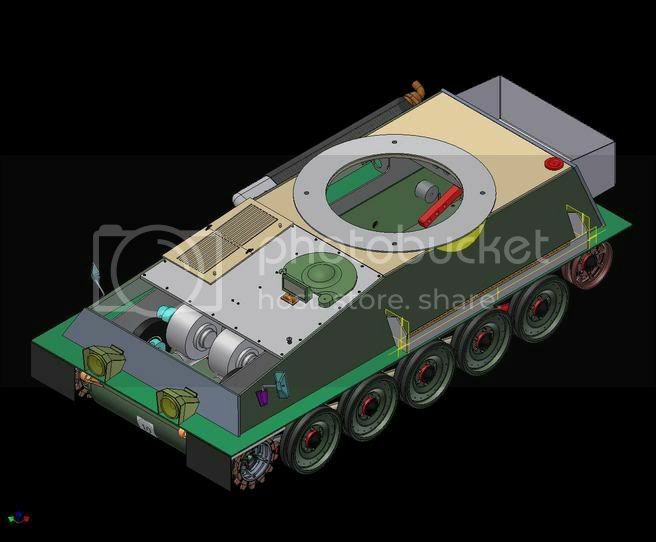 The best plan would be to ask Accurate Amrour very nicely if they would cast a 1/15th scale turret as a one off. I already have the 1/15th scale kit, and brilliant though it is, it does not make build ing the turret any easier (though much much easier than scaling up a 1/35th version). 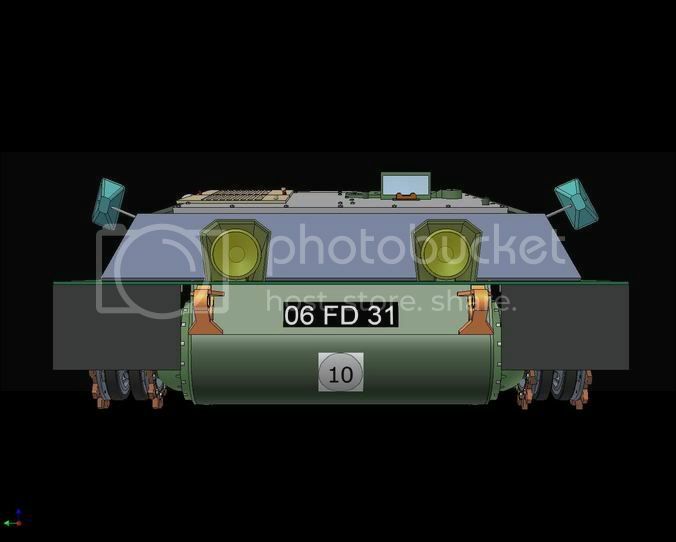 It may be possible to get the turret scanned into a 3d program, using some fancy equipmnt. But then you are into all sorts of issues with copywright etc. Anyway, I've just received my common parts manual for the CVR(T) range today, so I might be drafting up a bit more tonight. What would be great is to get Bob G involved as he is the fountain of all modern tank knowledge and I know he has built a Sultan which uses all the main CVRT bits, maybe he has some good info. I'll need to wait until he comes back from Hols before I ask. I also need to complete some drafting work for him for his Cheiftain anyway. Drawing looks great so far. I like the idea of a community project so you can count me in. Iâ€™m currently building some low cost spin casting equipment, along the lines of the gear shown on the East Piedmont Armor Club website, but including the spin caster as well. ( any help with the spin caster project would also be appreciated). If the casting gear is finished in time for the prototype to be build then Iâ€™d happily donate a set of moulds and Mazak casings for it. 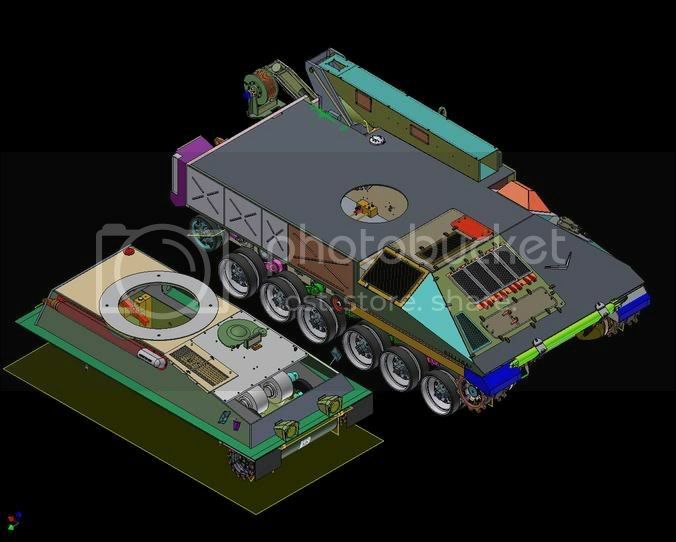 I to was looking for a low cost vehicle that I could own in numbers (three) that would allow the whole family to play together, I was looking at Supacat ATMPâ€™s but now Ill put that on hold and await the outcome of this project. Just let me know what I can do to help. Thanks for your mail. Maybe you could cast the track links? I need at least a month to two months to finish the details of the chassis and the running gear before I'm happy with the design (I said this about the warrior, so it could / will change). 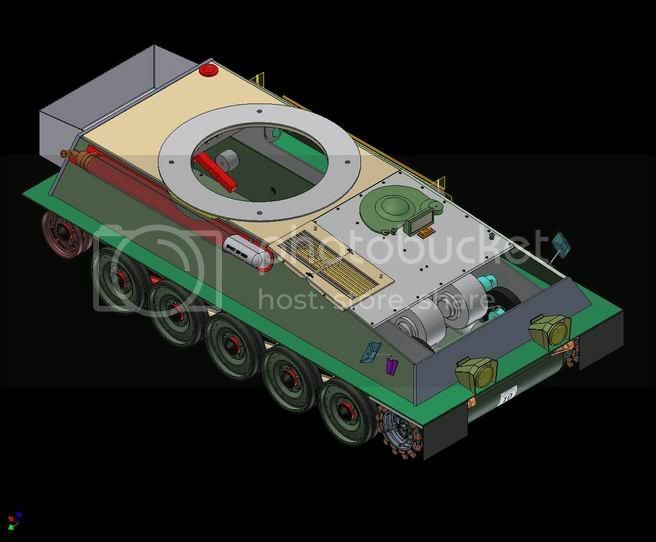 I just receievd the parts list for teh CVR(T) and wow, lots of details so lots to do, so on that note, I'll nip off! 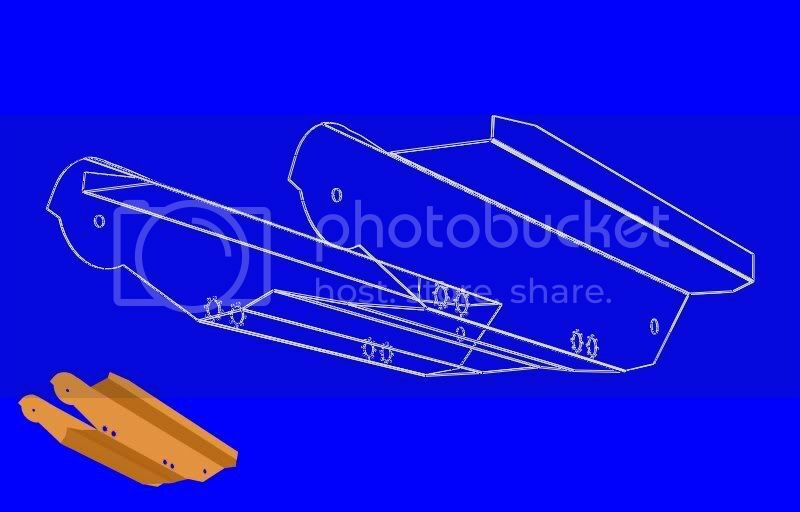 Welding laser cut panels together from 2mm sheet steel is better than bending as much as possible? Cheers. No problem, you can put me down for that. How many links does it have? and what is the rough size? Have fun everyone, I'm off on the summer hols with the kids! Wish me luck. Bending the plates while a good idea, does have some problems for this particular design. The front glacis plate needs to be rolled not bent and the rear hull plate is bent twice. When I welded the warrior hull up using this process it was all quite easy to do, plus P&P was minimal because the volume was negligible. Tracks links are approx 75 each side, each link will be around 3" by 2" approx 15mm thk. Speak to you guys later, off for a spot of lunch! Hi there lads, just thought I would post some more pics of the WIP. All feedback is appreciated good or bad (as long as it is constructive). Last edited by AndyR on Mon Jul 11, 2011 12:04 am, edited 1 time in total. Looking good. What are you using as your references? Thanks matey, I'm using a few line dwgs I have of Sabre, Scorpion and Scimitar. I also bought the following manuals from MV vintage manuals, common parts manual (loads of illustrations) and the Precis which ahs loads of really really good information and some sectional dwgs (nothing of the turret though! I have also bought a highly detailed model kit so I have a pretty good library of sources. Theses sources are continually expanding as I have bought another parts manual for Sabre and the overall vehicle handbook which covers all the varients. All in all I have pretty good references. THe model kit is good but it's only a starter for ten as you need to cross check just about everything agaisnt line dwgs and the parts manuals (but I love this aspect of the hobby, reverse engineering).